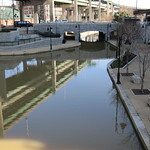 The Richmond canal system first started in 1789 after George Washington lobbied the General Assembly to proceed with his vision of a canal and turnpike system that would connect the harbors of the east to the trade and market opportunities west, all the way to the Rocky Mountains. Canal cruises of the James River and Kanawha Canal along Richmond’s Historic Canal Walk include a historically narration to educate visitors and residents about Richmond’s canal system. Cruises are 40 minutes and operate seasonally. Departure location is the Turning Basin, between 14th and Dock streets on Virginia Street. Visit the website to get dates, times, prices, and directions.